The Strong Wind Signal, No. 3 was issued at 12:40 p.m. This means that winds with mean speeds of 41 to 62 kilometres per hour are expected. At 1 p.m., Severe Tropical Storm Yutu was estimated to be about 360 kilometres southeast of Hong Kong (near 19.9 degrees north 116.5 degrees east) and is forecast to move north or north-northwest at about 12 kilometres per hour crossing the northeastern part of the South China Sea. 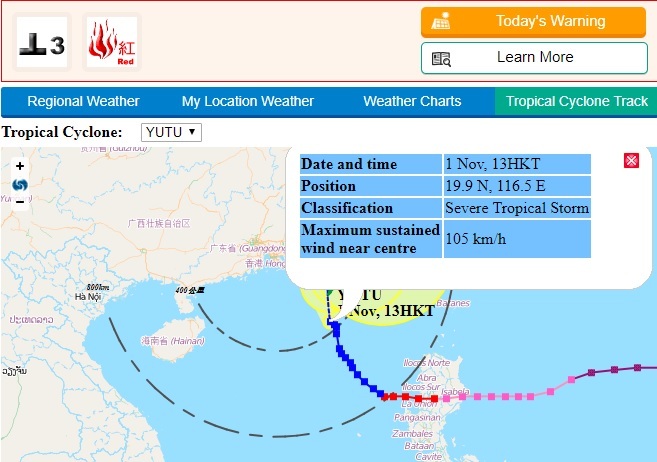 According to the present forecast track, Yutu will continue to edge closer to the coastal waters of eastern Guangdong today. With the combined effect of the northeast monsoon and Yutu, winds over the coast of eastern Guangdong are expected to strengthen gradually this afternoon and tonight. Unless Yutu takes on a track closer to the Pearl River Delta, the chance of issuing the No. 8 Gale or Storm Signal is not high. As there are swells, you are advised to stay away from the shoreline and not to engage in water sports. 1. Precautions should be taken. Make sure objects likely to be blown away are securely fastened or taken indoors. 2. Construction and property management practitioners should make sure that overhanging facilities and temporary structures outdoors are securely fastened or placed on the ground, and complete precautionary measures as soon as possible. 3. Small vessel owners should now complete all safety arrangements and return to nearby typhoon shelters. 4. Listen to radio, watch TV or browse the Hong Kong Observatory’s website and mobile app for the latest information on the tropical cyclone.